This review was originally written for and published in The Wheaton Record on October 3, 2014. 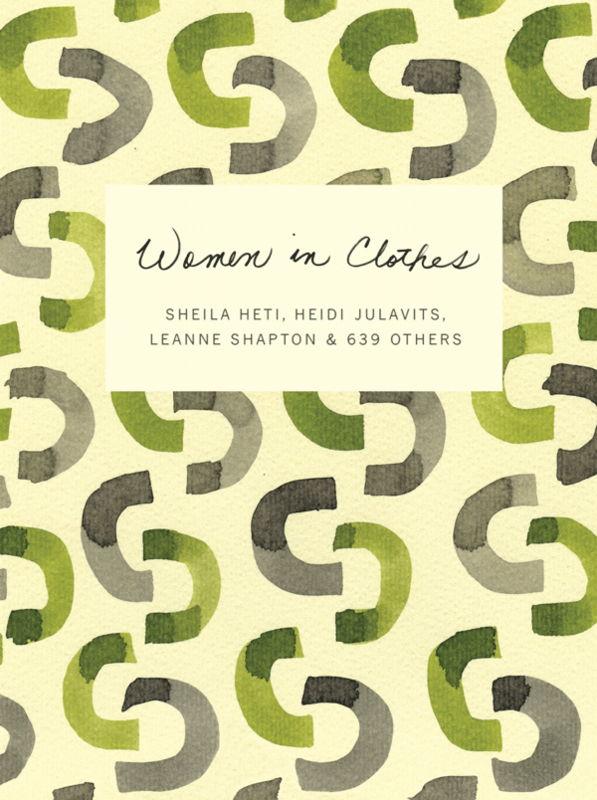 Conceived and edited by New York-based authors Sheila Heti and Heidi Julavits and artist Leanne Shapton, “Women in Clothes” is a compilation of interviews, journal entries, photo essays, conversation snippets and more collected from over 600 women. The book uses the voices and experiences of women from a broad array of backgrounds to examine the basic questions that drive women as they stand in front of their closets every morning. Much of the book grew from a survey sent out by the editors, which included questions about everything from cultural heritage to daily habits. Responders ranged from a hijab-defending Muslim to a transgender women in London, from TV personality Lena Dunham to someone’s five-year-old daughter. The result of this diversity is a pleasant cacophony of stories that combine to create a volume that feels like a truly immersive exploration of what it means to be a woman in clothing — regardless of age, class, race, occupation, religion or geography. Moreover, the images peppering the volume with vintage photographs of mothers before they had kids, line drawings of discarded clothes on the floor or collections of suits on dress forms make the book feel almost like a record of a global community art project. The implicit message of this non-linear tome is that the act of clothing oneself is a much richer and deeper aspect of human existence than is often recognized. By asking questions that have little to do with being on top of current trends or having a vast knowledge of designer histories, the editors access the truly universal aspects of having a relationship with clothing. Keeping in mind that everyone wears clothes and thus has some opinions about them, the editors formatted interviews and surveys in such a way that those who feel outside the traditional boundaries of the fashion industry are not estranged. While the opinions of important public figures like celebrities or artists are included in “Women in Clothes,” the organization of the book gives equal weight to the teenage Israeli soldier talking about her uniform as it does to the designer talking about her boutique. The resulting democracy of opinion makes for a surprisingly well-balanced view of what clothing actually is and does. One of the biggest possible objections to the book is its gender exclusivity. While there is nothing wrong per se with making a volume specifically geared towards women, it does seem a pity that most men will likely miss out on the riches enclosed between these two covers based on the title alone. After all, one of the implicit tenets of the book is that clothing is important for everyone, regardless of who they are, and the nuggets of truth contained in “Women in Clothes” often have more to do with being a human than they do with being a woman specifically. Nonetheless, “Women in Clothes” provides a refreshing lens through which to view the activity of dressing. It successfully offers a golden mean for those looking to walk the line between the extremes of over-examination of clothing by the fashion establishment, or complete dismissal by those who see fashion as a superficial waste of energy. By relying on diverse voices and diverse avenues for considering attire, “Women in Clothes” facilitates deep thinking about the real significance of what we put on our bodies.